Rochelle Intermodal | N Scale layout » Blog Archive » The end is in sight…! The end is in sight…! The end of what, you ask? The railroad room! 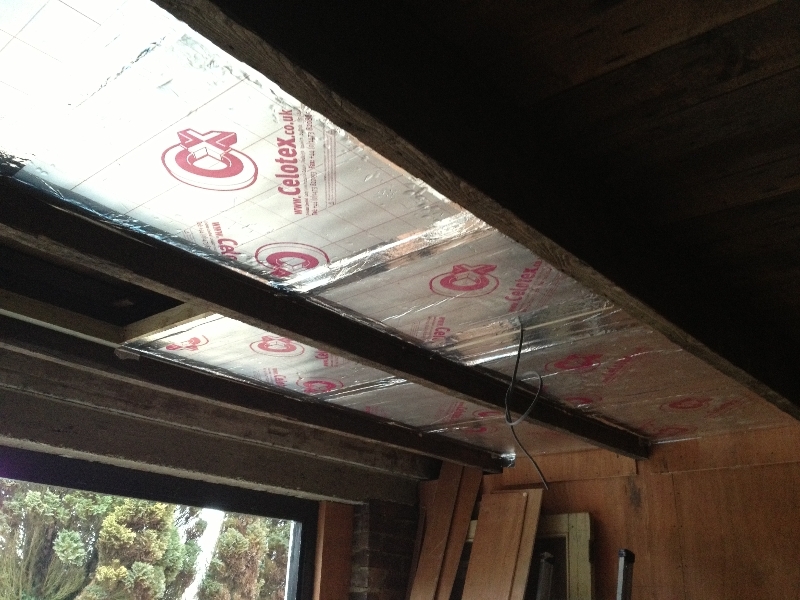 Last weekend I made good progress on the ceiling – the sections where the lighting will go are all insulated and ready for the plasterboard, which arrived this morning. 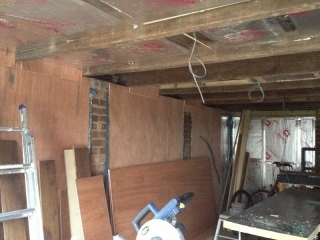 This weekend will be a manic 4 days of getting the whole ceiling done as well as the last few plywood wall panels. My wife, Lucy, will be filling all the screw holes in the plywood, then putting the first coat of paint on. Hopefully I will be able to get the electrician over in the next few weeks to finish connecting everything, then finally there will be light (and power)! My next bit is to lay the floorboards – well, try to and see if they will work – they are left over from the house after a flood we had last year. The lounge floor was replaced and those boards are now stacked in the garage – undamaged, luckily. Our flooring guy suggested I use them in the garage, which I think is a brilliant idea. So, let’s hope they fit together again! So, here are two photos showing the current progress – I’ll hopefully have photos of a finished ceiling by the end of the Easter weekend!